This campaign is about preserving our historic meetinghouse and its parsonage, and making sure the church building is a safe, inviting space for all who use it now and in the future. The meetinghouse is truly a community house. As with any >200- year- old building that is heavily used, maintenance is an ongoing, expensive, never-ending proposition. Major projects, predominately related to safety and preservation and that are necessary to meet future needs, can no longer be postponed. The Church and AFC partnership is asking the congregation and the community to help financially with the work planned. Read the November 2018 press release. Visit the Church website for more details. Why is the ACF involved? 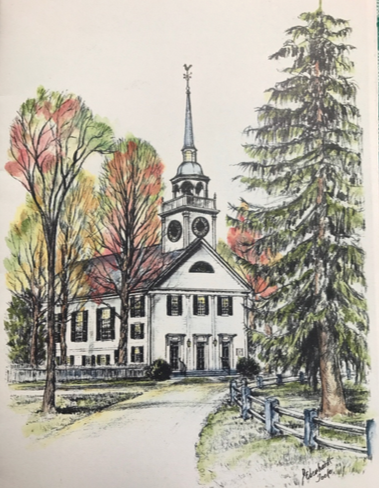 Recognizing the importance of the historic meetinghouse in the life of the community, the ACF is partner- ing with the church to raise funds to ensure that the building will be preserved, safe, and secure to serve future generations of Amherst citizens. The ACF, dedicated to “enhancing the quality of life in Amherst, “ believes that this joint project carries out its mission. As a 501(c)(3) corporation, it will act as fiscal agent for receipt of funds from the public. How does the community use the meetinghouse? Countless weddings, funerals, memorial services, and meetings. The church set a goal of $850,000. In a tremendous response from the congregation and two local grants in the first three months of the campaign, the church has received gifts and pledges of over $500,000. With the help of the congregation, the community, and grants from local foundations, it believes the church will reach its goal.